Nissan has revealed the updated facelift version of the X-Trail SUV for the European market. The SUV will underpin the same platform as its sibling Qashqai which is also reportedly being built for the local market. The Nissan X-Trail will be the latest recipient of the company’s semi- autonomous ProPilot driver assistance suite, which will be launched in its home market of Japan itself. The rejuvenated Nissan X-Trail can now accelerate, brake and steer without driver inputs. The third generation model of the SUV has been updated globally, both for the US and European market but carry a different label. The X-Trail Facelift measures 4,064 mm in length, 1,082 mm in width and 1,710 mm in height and has a wheelbase of 2,705 mm. The 2017 X-Trail has adopted Nissan’s latest iteration of the V-motion grille. The grille now blends and penetrates deep into the new front bumper of the SUV. The newly designed headlights now feature twin projector setup along with styled daytime running LED’s. The side profile has remained unchanged except the cladding. The SUV now rides on 19 inch alloy wheels. The rear of the car is designed in dual-tone bumper with chrome finery and tail lamps with new LED boomerang graphics. Talking about the interiors the new X-Trail Facelift includes a new D-shaped steering wheel with control buttons, new gear level, a revised centre console new graphics for the audio and satellite navigation system. In Japan, the X-trail is offered with petrol and hybrid powertrains, with front or all-wheel drive via Nissan X-Tronic CVT unit. The 2.0 litre engine is coupled with an electric motor and generates 179 bhp and peak torque of 207 Nm respectively. The X-Trail is available in both 5 and 7 seater option. India launch might take place towards the end of this year. The all new X-Trail Facelift will be imported to India from Japan via CBU (Completely Built Unit) route. 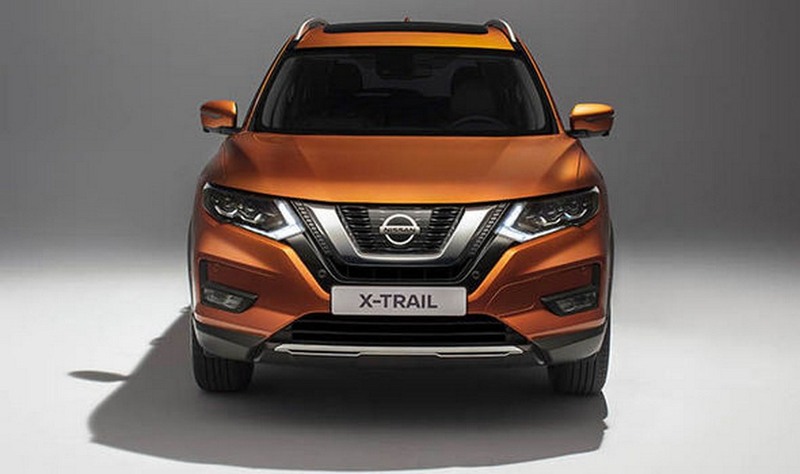 The X-trail might come with a wide range of advanced and very important safety features like rear view camera, anti-lock braking system (ABS), electronic brake-force distribution (EBD), brake assist, active trace control (ATC), hill start assist, dual front impact SRS airbags, curtain airbags, rear door child locks, Nissan Anti-Theft system, (NATS) etc. Stepping in the league the all new X-Trail will compete against the likes of Honda CR-V, Hyundai Santa fe, Hyundai Tucson and others. Nissan, Hyundai, Maruti Go Waterless At Service Station To Clean Cars – Save Million of Litres Every Year!